Have you found an ancestor that no one in the family believes existed? I was researching my Fredrick side of the family at the Manistee Historical Museum in Manistee, Michigan and found one. I was looking in their card file for the Fredrick surname and came across a Leonia Frederick, daughter of Mr. and Mrs. August Fredrick, my great grandparents. Source: Manistee Daily News, (Manistee, Manistee, Michigan), 18 October 1899, newspaper transcription; Manistee County Historical Museum, Manistee, Michigan. Information transcribed and found in museum's card file. "Leonia Frederick, 2 year old daughter of Mr. & Mrs. August Frederick of 35 Filer St. died yesterday from measles. Interment in Oak Grove. Manistee Daily News Oct 18, 1899"
Upon seeing this I had to find more information. 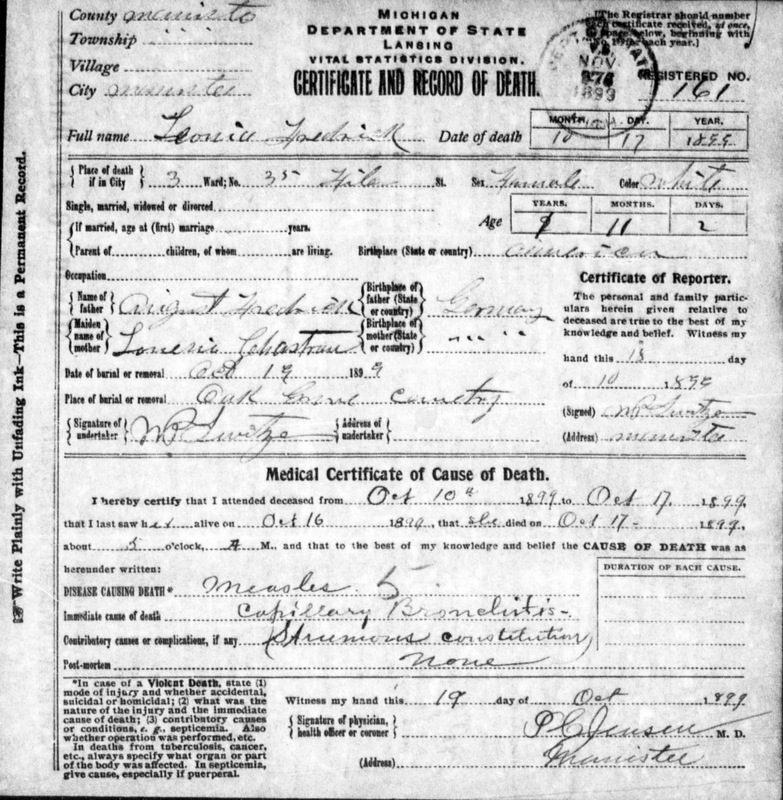 I found the death certificate for Leonia Fredrick. 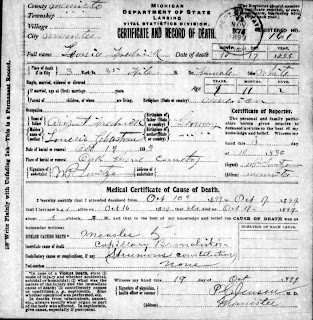 ﻿Source: State of Michigan, "Death Records 1897-1920," database, State of Michigan, Seeking Michigan (http://seekingmichigan.org/discover-collection?collection=p129401coll7: accessed 11 July 2010), Leonia Fredrick Death Certificate No. 161 Manistee County, Michigan; citing Michigan Department of State, Lansing, Vital Statistics Division. From the death certificate I learn that Leonia Fredrick was 1 year, 11 months, 2 days old. If this information is correct, her birth date would be November, 1897. She had a brother, Leonard, born in November, 1897. Twins? Leonard's son, Bill, is still living and we have shared a lot of information, but he had never heard of Leonia. He was very interested though. He said his dad never talked about his family, which is the case in many families. Leonia Fredrick was real. Unfortunately, she died at an early age of measles. How sad that she wasn't remembered by the family. (Or was she? Her brother, Otto August Fredrick, named one of his daughters, Leona.) I will remember her and she has a permanent place in my family tree, whether the family believes it or not. While I understand the difficulty in talking about a child that has died, no one remembers if those conversations don't take place. I'm so glad you found your aunt - though she died a child. Susan, thank you for posting. I felt she was an important part of the family history. Where in the World is Harry Glover?